Many things can cause roof damage. From Storms to Animals, and everything in between! Rockwall Metal Roofing is aware of what a headache dealing with Roof Repairs can be! One of the main concerns is making sure that the material is of a great quality! At Rockwall Metal Roofing, we use only the best quality materials! When we repair your roof, we want it to last as long as possible for your home! The second roofing concern is hiring a Quality Company! Choosing the right company is choosing to have the best Quality Roof Repairs! We only hire The Best! As a Family Owned and Operated company, we treat you like one of our own! 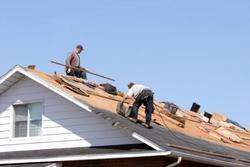 Roofing Repair is known to be a big hit to the bank account. We want to make that hit as small as possible. Our prices and payment plans are designed specifically to get you the best deal! It is so important to make sure to hire someone who specializes in your preference of roofing. Ironically, we specialize in many! We offer a variety of roofing styles; and are always searching for the newest and most innovative roofing styles! We are sure to be able to please even the most picky of home owners! Each job is specified to the certain needs of that home. For that reason, we don't have generic price plans. Each plan is tailored to the job we are doing! There is no reason for you to pay for a service generally included in the price if you don't need it! As mentioned before, we want you to get the best bang for your buck!